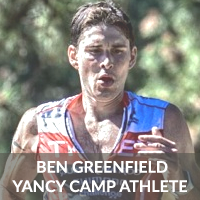 Premier OCR Athlete Ben Greenfield - Yancy Camp - Fitness for Everyone! Ben Greenfield is an ex-bodybuilder, Ironman triathlete, Spartan racer, coach, speaker and author of the New York Times Bestseller Beyond Training: Mastering Endurance, Health and Life. In 2008, Ben was voted as NSCA’s Personal Trainer of the Year and in 2013 and 2014 was named by Greatist as one of the top 100 Most Influential People In Health And Fitness. Ben blogs and podcasts at www.BenGreenfieldFitness.com, and resides in Spokane, WA with his wife and twin boys. Ben is excited to partner and train with clients from all over the world who are ready to join him #YancyCamp Training Program.